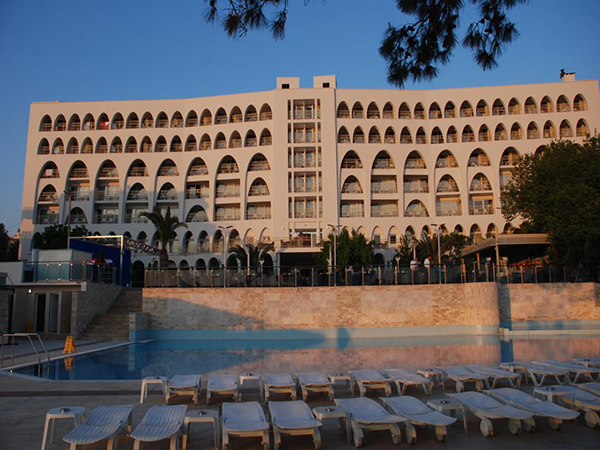 The Golden Day Wings Hotel is now firmly established as a favourite with Irish holidaymakers in Kusadasi and caters for singles, couples and families. The Golden Day Wings has one of the most unique locations overlooking the Aegean sea, situated a short stroll from the marina on an elevated incline and offering exhilarating views of the Kusadasi coastline and the harbour, as well as being within easy walking distance of the centre. A new development of small shops and café bars at the Marina add to the sophisticated ambience of the area. LOCATION;The hotel commands an excellent coastal location only 300 metres from the marina and enjoys stunning sea views. The centre of the resort is approximately 1km away. Town beach is less then 500 metres away and ladies beach is approx 2.5km away and is easily accessible with the local service which stops close by the hotel. ROOMS;Modern and tastefully furnished bedrooms with individually controlled air conditioning, satellite tv, direct dial telephone*, bathrooms with shower, hair dryer and furnished balcony. All rooms have a mini bar and tea coffee making facilities. At the time of booking you can specifically confirm a Double room with one double bed, a Twin room with two single beds and an extra sofa bed for a child or a Triple room with 3 single beds and an extra sofa bed which can accommodate a family of 2 adults and 2 children. FACILITIES;Large swimming pool • kids section within the pool •water slide pool • extensive sun terrace with sunbeds and umbrellas • poolside bar/snack bar • 24 hour snack/room service • mini club (ages 4-12) • A La Carte restaurant • 24 hour reception • TV lounge showing all major sporting events • playground • mini-market • billiards* and table tennis* • day and evening entertainment • internet access* • spa with Turkish bath*, sauna* and massage* • hairdresser* • boutique • safety deposit box*(in reception) • wifi* • * * These services incur an extra charge The hotel is not suitable for clients with walking difficulties.